Sew Happily Ever After: Get Out of That Sewing Funk! Get Out of That Sewing Funk! Have you ever been in one of those funks? You know the one where you want to sew, you just don't know what exactly it is that you want to make. You just don't know where to start. Or which fabric to use. Or what pattern to sew. You start browsing Pinterest hoping to find some inspiration, but 3 hours later you realize that you have been completely sucked in, you didn't get any actual sewing or crafting time, and now your kids are ready for dinner. Yep, true story. It's happened to me. 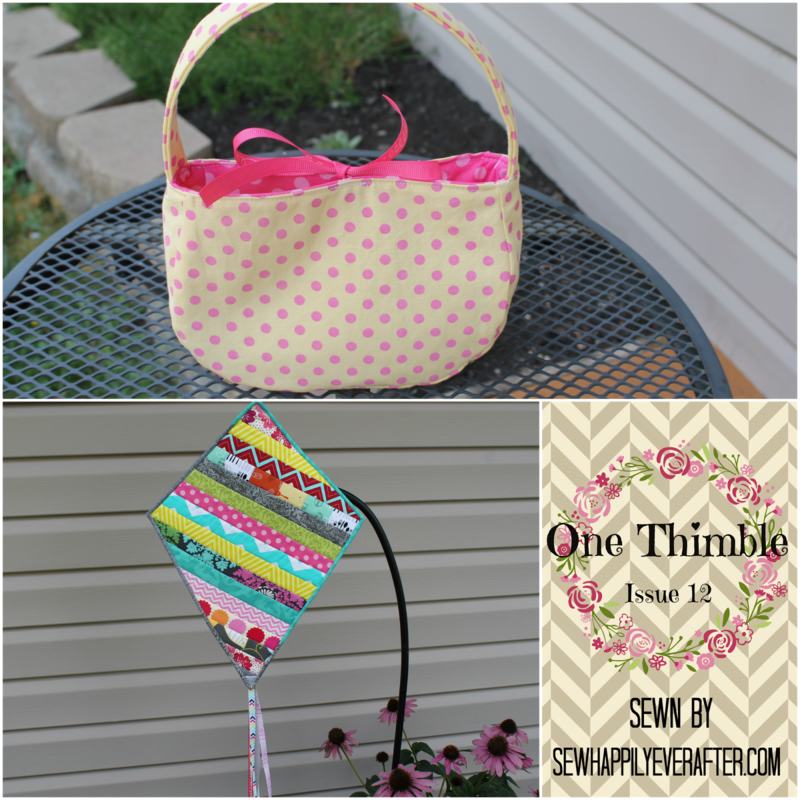 I'm always so glad when a new issue of (affiliate) One Thimble comes out. I love the fresh layout and the sewing articles, but mostly I look forward to the new patterns! Each issue is packed with not only information, but also brand new patterns. 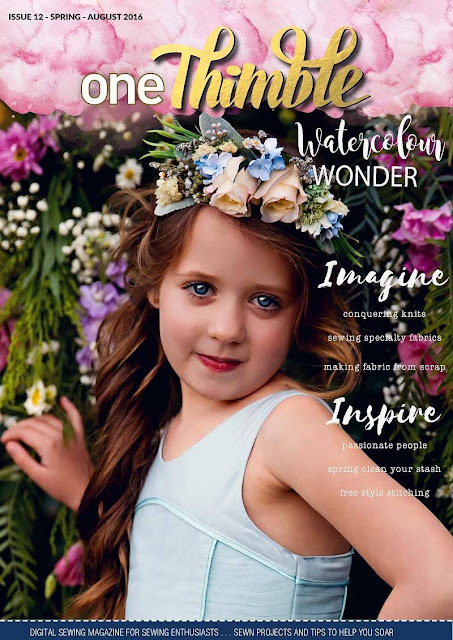 The patterns in each issue are drafted specifically for the theme of that issue, so you are guaranteed to have several new patterns all at once and none of them will be duplicates. The theme for this issue is watercolor--what an inspiring and pretty theme for this season. I was able to get my hands on two patterns from this issue, both from the designer Molly and Mama. The(affliate) Darling Daisy Girls Bag is a darling little open purse with a beautifully hand embroidered smiling daisy on the front. I opted to leave the daisy off of this purse. It's a very darling little size and I can just see some little lady carrying this beauty into church one day with her crayons and a little Bible inside. I added the ribbon ties as an afterthought to keep it closed. The purse is a very easy sew, which would make it a really perfect project for a child learning to sew. The embroidery instructions are very well written as well and I do believe a beginner with patience could accomplish that bit of hand sewing as well. The (affiliate) Flutterby Kite pattern is a beautiful pattern for learning beginning quilting techniques. I chose to make the strip work version and boy did I have a fun time sifting through my scrap bins! I pretty much pulled fabrics that I liked and cut them into 1.5 inch strips. I was really going for a scrappy look so I didn't pay any attention to the colors or patterns that I chose. I simply chose the ones that I liked or that reminded me of a special event or project. I even managed to sneak a strip of already pieced fabric from the Whip It Up challenge that I participated in. I love how it turned out! I have done some quilting before, so this wasn't a new type of project to me. I did choose to do a traditional quilt binding on this kite rather than the bias tape binding that is called for in the pattern. I actually used some of the same 1.5 inch strips from the main kite to make a very narrow binding. I love attaching the quilt binding to quilts. I know that seems a bit odd, but I really love this aspect of quilting. It is just very satisfying to see all the pieces finally come together! Don't miss a stop on the tour!